A lot has happened regarding my bronchiectasis recently, so I need to write about it here to learn more about the medication I’m on and what it might be doing to me. I posted on this a couple of weeks ago, and that was an update on my first important post on the subject. But last time I wrote about an ‘acute exacerbation’, as the literature has it, of my condition, and what I believed was its cause. As it turned out, I was completely wrong. My doctor thought it might be viral, while I was privately convinced it wasn’t. I was given a doctor’s certificate and told to take a couple of days off, because I could benefit from the rest and because I might be infectious. I reluctantly did so, but was back at work the next day when I noticed a missed private call on my phone. It took me another day to respond, and it turned out to be my doctor telling me that my sputum tested positively for two viruses, influenza A and a human rhinovirus. Oh dear. I had to take more time off work, and my doctor told me not to worry about the antibiotics (it was a small course and I’d finished them anyway) and gave me a puffer with 60 doses of Alvesco®, which is ciclesonide, a synthetic corticosteroid which ‘prevents the release of substances in the body that cause inflammation’, according to this website. This was on top of the ingestible steroids, the subject of my previous post, though I didn’t go into detail about those pills, which I’ll rectify shortly. He also gave me a nasal spray for my rhinovirus, and arranged for me to have a consultation with a professor of Chesty Things at the RAH Chest Clinic. So I’d like to look more carefully now at the medication I’ve been prescribed, apart from the antibiotics. Firstly, Panafcortelone®, 30 white tablets each containing 25mg of prednisolone, an anti-inflammatory steroid much like ciclesonide. The worry about steroids is that they can interact with other medications to our detriment. They can also weaken our immune systems under some circumstances. I must say, though, that I’ve never yet had an adverse reaction to any medication I’ve taken. There’s quite a list of ailments that can be adversely affected by steroid use, no matter whether it’s prednisolone, ciclesonide or any other steroid, it seems. However, they shouldn’t be confused with anabolic steroids, notoriously misused by athletes. Avamys is used to treat symptoms of allergic rhinitis including stuffy, runny or itchy nose, sneezing, and watery, itchy or red eyes. The effects are usually felt within the first day, although some people will not feel the effects until several days after first taking it. I took this medication regularly as prescribed for 5 or 6 days, then dropped off, as I obviously felt a lot better. It contains 30 sprays, and I wasn’t told to keep taking it to the end, as far as I can recall. The leaflet says that ‘once symptoms are controlled you may be able to decrease your dose to one spray in each nostril per day [down from 2]’. However it says elsewhere: ‘Do not stop using Amavys or change the dose without first checking with your doctor’. So I’ll try to keep taking it, though I don’t feel that I need it. My symptoms have always been mild compared to the description above. An anticholinergic agent is a substance that blocks the neurotransmitter acetylcholine in the central and the peripheral nervous system. Anticholinergics inhibit parasympathetic nerve impulses by selectively blocking the binding of the neurotransmitter acetylcholine to its receptor in nerve cells. The nerve fibers of the parasympathetic system are responsible for the involuntary movement of smooth muscles present in the gastrointestinal tract, urinary tract, lungs, etc. Anticholinergics are divided into three categories in accordance with their specific targets in the central and/or peripheral nervous system: antimuscarinic agents, ganglionic blockers, and neuromuscular blockers. Tiotropium is described as a muscarinic receptor antagonist (MRA), which means that it blocks the muscarinic acetylcholine receptor, found in the cell membranes of some neurons and other cells. Muscarinic receptors are divided into types, and the one I’m concerned with is the M3 receptor, which plays a role in bronchoconstriction. Theophylline is a type of medicine called a xanthine bronchodilator. 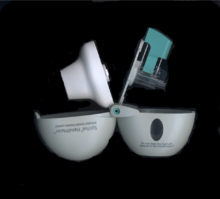 It is used to open the airways. Theophylline causes the muscles surrounding the airways to relax by a mechanism that is not fully understood. This allows the airways in the lungs to open. In conditions where the airways tighten, such as asthma or chronic obstructive pulmonary disease (COPD, eg emphysema and chronic bronchitis), it is difficult for air to get in and out of the lungs. 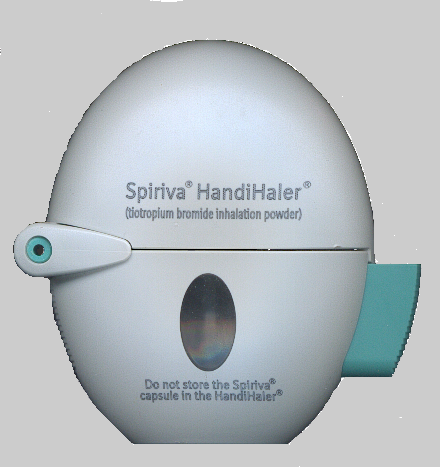 By opening the airways, theophylline makes it easier to breathe. So all these medications are to help me breathe easier, but of course I’m hoping to be cured, and the professor, a lively and interesting gentleman, informed me that my lung function test, like the previous one earlier this year, came up very positively. That’s to say, my lung functionality is above average even for a normal person, so I’m really not having any difficulty breathing at all, I think… In fact, the professor mentioned a lung capacity of 106%, which doesn’t make much sense to me, and I forgot to ask for clarification (I’ve never given a student more than 100% for any test I’ve given them). In any case I’m to go back to him around April for another consultation, by which time all these medicaments will be consumed. I think the hope is that some of the blocked areas as revealed on my CT scan will be a little less blocked. So maybe there’ll be another CT scan in the pipeline. The professor took me on a tour of my lungs via the previous scan, pointing out that because the whole of the right lung is affected by little blockages all through it, no operation would be possible, as might be the case if it was one localised very badly blocked region. presumably he was talking about an operation to remove a section of the lung. The left lung is not affected at all, which is apparently quite unusual. Anyway, I’m always the optimist, and I’m hoping that maybe I can yet be cleared of all this gunk, and so cured. Thanks Akshay for your interesting comments – I’ll respond a little more fully soon. I have recently been diagnosed with bronchiectasis. We are currently looking into Ayurvedic therapies. I don’t have any previous history of smoking, TB or pneumonia. I have no other medical conditions besides the bronchiectasis. I have had cough for a very long time, however doctors were unable to determine the cause for this. Starting from the end of 2014, I started expelling phlegm. Then in May 2015, I started coughing blood. This continued for a week. When I went to see the doctor, he was prescribed a 10-day antibiotic course and referred to a pulmonologist. The pulmonologist performed a bronchoscopy and found E. Coli cultures, while also diagnosing me with bronchiectasis. The pulmonologist started another round of antibiotics for 5 weeks (the course ended in the third week of July). After this course, the blood in phlegm disappeared but the coughing and expelling of phlegm continued. However, starting in the last week of September, I again started expelling phlegm covered with blood. We saw the pulmonologist during the first week of October, and he began a 21-day anti-fungal regime, which I currently taking. Again blood in phlegm started from Oct. 10th and pulmonologist has put me on two anti-bio. I am also on two puffers which I will have to take regularly. I am terrified of this recurring infection. I too am an Indian and looking for Ayurvedic treatment but as you said “Ayurveda has become commercialized and everyone claims having medicines for everything.” It is hard to find right one.